A physical therapist education is much needed by those who wish to become a physical therapist. A good education is a foundation to a good future. For those who are about to apply to a school for physical therapy, you should know the required education for you to fully become a physical therapist. In order to become a physical therapist, you should obtain a graduate degree. In most cases, a person will be required to hold a doctorate degree in physical therapy. College programs in physical therapy are typically a combination of coursework and clinical rotations. Also, states require individuals to be licensed to legally work in this field. For physical therapist education, one must undergo an undergraduate education. Aspiring physical therapists have their options in areas of study at the undergraduate level. You can choose to enroll in a major that includes significant science coursework, like biology, anatomy and physiology. However, there are some schools that offer a pre-physical therapy major in health and physical education departments. Such curriculum may require courses in science and health-related topics like exercise physiology, physical education methods and personal wellness. Since physical therapist education requires students to have a graduate education, doctoral programs are in greater supply but some master’s programs are available. These programs have varying requirements for admittance, which may include minimum standards for grade point average, standardized test scores or volunteer hours. There are also a lot of programs that have prerequisite course requirements. A DPT or Doctor of Physical Therapy programs train students in the procedures of diagnosis and treatment. This is an optional physical therapist education. The coursework in this program covers topics in anatomy and procedures in physical therapy such as therapeutic applications and exercise. 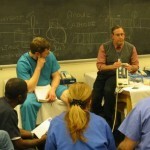 There are also some DPT programs that have integration and assessment courses that allow students to apply the techniques they have learned though simulations. Clinical clerkships in DPT programs place students in healthcare facilities under the supervision of licensed physical therapists. The students may undergo an introductory practicum where they observe a workplace. There are some clerkships may be part-time and integrated with coursework, while more advanced clerkships are full-time. These experiences cover different methods of physical therapy which includes rehabilitation and acute care. If you are planning to take this particular physical therapist education, you may also consider some programs that are accredited by the Commission on Accreditation of Physical Therapy Education or CAPTE. This organization is recognized by the U.S Department of Education and the Council on Higher Education Accreditation as the only accrediting agency for physical therapy programs. Once you have completed your physical therapist education, you must need to get your license in order for you to finally work legally in your chosen field. You have to go through an exam. States typically require a passing score on the National Physical Therapy Examination as part of the licensing requirements. There are many states that require a jurisprudence exam that tests individuals on the laws of the state. In order for one to remain licensed, continuing education standards may need to be met. Finding schools for physical therapy won’t be hard, there are plenty to choose from! This entry was posted in Schools for Physical Therapy on November 21, 2011 by FindItOnline.